There are many feasts of the Mother of God, commemorating the events of her life, her intercessions for us after her death, and her innumerable miraculous icons. Her most significant and solemn feast is certainly her Dormition which includes her bodily Assumption, commemorated on August 15/28 and preceded by two weeks of fasting. The feast is often known as the “summer Pascha,” and is celebrated with great pomp throughout the Orthodox world. For instance, in Jerusalem on August 12/25 a Liturgy is served at Little Gethsemane, followed by a Molieben and a procession with her burial shroud to her sepulcher in Gethsemane proper, in which all the members of the Russian Spiritual Mission participate. On the morning of August 14/27 the clergy, monastics, and faithful embark upon a two-hour procession from the Jerusalem Patriarchate which culminates in the service of Lamentations at the Gethsemane Skete, where is placed the burial shroud of the Mother of God amidst fragrant flowers and myrtle and adorned with precious coverings. On the Apodosis of the feast (August 23/Sept. 5) the burial shroud is returned in another solemn procession. This is but one of the celebrations throughout the Orthodox world that could be described that demonstrate the great love for the Theotokos that resides in the hearts of the Orthodox faithful. Following the resolution of the Nestorian controversy in 433, public veneration of the Theotokos in liturgical and artistic settings took on greater importance and spread rapidly. Several churches and monasteries were built in her honor in the fifth century, and she was celebrated throughout the whole empire on a day before or after the Nativity since the late fourth century. The ancient Armenian lectionary from Jerusalem compiled between 412 and 439 lists the commemoration of the Mother of God on August 15 in the Church of the Kathisma, and the feast was made obligatory in the East as a celebration of her Dormition by Emperor Maurice (582-602). Interest in the death of Mary existed in Palestine by the late fourth century, possibly connected with the tradition surrounding her tomb in the Kedron Valley. 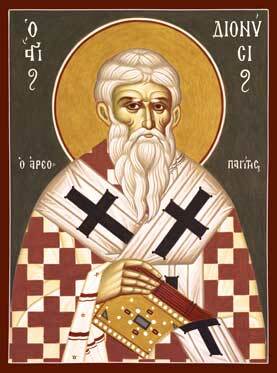 An early witness to this interest is St. Epiphanius of Salamis, and his words are surprising. He writes, “[N]or do I say that she remained immortal; but I also will not say definitively that she died. For the Scripture goes far beyond the human mind, and has left this point undecided because of the surpassing dignity of that vessel [of God] …” and “If the holy Virgin died and was buried, her falling-asleep was honorable and her end holy; her crown consisted in her virginity … Or else she remained alive; for it is not impossible for God to do whatever [H]e wills. In fact, no one knows her end.” This ambiguity is compatible with the Roman Catholic dogma of the Assumption of Mary which was proclaimed on November 1, 1950 by Pope Pius XII and states: “the Immaculate Mother of God, the ever Virgin Mary, having completed the course of her earthly life, was assumed body and soul into heavenly glory” (emphasis added). Following this intentional ambiguity, Roman Catholics are free to believe that she died, or not, but it is clear that by the time of Emperor Maurice’s decree the feast was universally understood to include both her death and Assumption, and this is the unquestionable understanding of the Orthodox Church. There is a long and complicated development of the traditions surrounding the Dormition and Assumption of the Theotokos. For most scholars the earliest extant witness to the story is found in a group of Syriac fragments dated to the late fifth century which describe the death of Mary, the reception of her soul by Christ, and the placing of her body in Paradise underneath the tree of life. There are also two Greek accounts from the late fifth or early sixth century (one attributed to St. John the Theologian) which expand on the Syriac account and include many of the details officially adopted by the Church and presented in the hymnography for the feast of the Dormition and in theSynaxarion. There is also a passage in On the Divine Names by St. Dionysius the Areopagite that speaks of the Apostles gathering to gaze at the body that was the vessel of God. Scholars consider this a pseudepigraphal work from late-fifth-century Syria, but notable Orthodox voices such as Fr. John Romanides and Fr. Dumitru Stăniloae upheld the authenticity of the writings, meaning there could actually be a first-century reference to the Dormition of the Theotokos.Following these fragments and disputed works, the oldest extant Greek homily for the feast is that of John of Thessalonica who served as metropolitan between 610 and 649, and the roughly contemporary sermon of the Palestinian bishop Theoteknos of Livias. There are several other well-known early homilies on the Dormition by St. Modestus of Jerusalem, St. Andrew of Crete, St. Germanus of Constantinople, St. John of Damascus, and St. Theodore the Studite, among others.Through the hymns for the feast of the Dormition and the Synaxarion the Church depicts the story of Mary’s passing from this life and her translation into Heaven. Having asked to be given notice of her coming repose, the Archangel Gabriel appeared to the Mother of God three days prior, announcing her coming sleep and handing her a palm branch from Paradise which indicated that in death she would overcome corruption. Rejoicing at the news she went to pray on the Mount of Olives where even the trees bowed in reverence to her. She then returned home and prepared herself for her burial. Her friends lamented that they were losing her but she assured them that she would continue to pray for them and the whole world. Suddenly there was a noise like thunder and her house was filled with the Apostles who had been miraculously gathered from around the world to bid farewell to the Theotokos—all except for the Apostle Thomas. Having taken leave of all present she prayed to Christ for peace throughout the world and gave up her holy soul to her Son and God Who had appeared with the Archangel Michael and a host of angels. According to some texts, Christ personally received her soul because she had prayed that He would preserve her from seeing the grotesqueness of the demons of the aerial toll houses. As was her childbearing, her death was painless. As the Apostles carried her bier in procession and sang with the angels the Jews became enraged and the priest Jephoniah attempted to overturn her bier, but his hands were cut off by the sword of divine wrath. The sight of his severed arms brought him to repentance and he was healed by St. Peter. The Apostles buried her most pure body in the Garden of Gethsemane, remaining in prayer and hymning for three days. On the third day, a Sunday, the Apostle Thomas arrived, lamenting the fact that he had not been blessed to bid farewell to the Mother of God, and so the Apostles decided to open her tomb to allow him to venerate her body. However, they were astonished to find that her body was no longer in the tomb, and they realized that she had been assumed bodily into Heaven to be reunited with her Son as our advocate before God. As Christ appeared to His disciples, proving His Resurrection, so too did the Mother of God appear to the disciples as they ate, saying, “Rejoice. I am always with you.” Following the Lord’s Ascension whenever the Apostles ate they would remove a portion of bread for the Lord and lifting it up proclaim “Great is the name of the Holy Trinity! O Lord Jesus Christ, help us,” and each would partake of the Lord’s portion. However, this time they proclaimed instead “All-holy Mother of God, save us!” and ever since a piece of Panagia bread has been set aside in her honor. This custom is traditionally followed still today in Orthodox monasteries. The Apostles were then miraculously taken back to their respective mission fields.It should be noted that although the Orthodox Church has not “formally” proclaimed the Assumption of Mary as has the Catholic Church, it is no less an unwavering teaching of the Orthodox Church, as seen in its hymnographic, hagiographic, and Patristic literature. Thus the oft-made assertion that it is “not dogmatic” is problematic because it gives the false impression that the faithful Orthodox Christian can justifiably deny the Assumption of Panagia, and fails to recognize the many avenues through which the Church proclaims the glory of Her truths. Her tomb in Jerusalem is indeed empty. Flowery language and theological reflections characterize the Patristic homilies on the Dormition and Assumption of the Theotokos. Two major points of emphasis are the Virgin’s incorrupt death and Assumption as a confirmation of the work of Christ that will culminate in the general resurrection of all mankind and her continuing and heightened role as intercessor for all mankind. Her death is a mystery, as St. Andrew of Crete says, and the final mystery bestowed upon her, rooted in the Mystery of Christ’s triumph over death. For St. Maximus, as Christ and His Mother have overturned the law of pleasure and pain through His pleasureless and painless birth, and as Christ has defeated death by His death and Resurrection, transforming it from a condemnation of human nature into a condemnation of sin, the same becomes true of the saints, first of all and especially the Theotokos. The same is true for St. John of Damascus who says that she overcame nature by her unique childbearing and therefore “It was fitting that she, who preserved her virginity undamaged by childbirth, should have her body preserved from corruption in death,” and thus her passing is referred to as a “deathless Dormition.” Although she was above nature, she submitted to the corruption of death as had her Son: “Imitating your Creator and Son, above nature you submit to the laws of nature.” She was a little lower than the angels through mortality, but “by her proximity to the God of all … she has ascended higher than the angels and the archangels and all the hosts that are found beyond them.” According to St. Andrew of Crete because she was so intimately tied into the economy of salvation her life cannot simply end in death. Following the regeneration of our nature through baptism and the seal of the Holy Spirit (i.e. chrismation), our mortal and passable bodies are such only by divine economy, see St. Maximus the Confessor, Letters to Thalassius LXI (PG 90:625-645), inasmuch as the saints voluntarily lay down their lives (as did Christ), even though they are blameless and innocent. Their innocence means that sin, and therefore death too, has no hold over them. Thus, their innocent and unjust death is like that of Christ, and signifies their triumph (through Christ) over the devil and death. This follows from St. Gregory’s statement that although the Lord has regenerated us through baptism and chrismation for the day of redemption “He has allowed us still to have a body which is mortal and passable.” This is a great mystery. Through Christ all corruption and death can be defeated within us, as it is in the Theotokos, and thus in some way our death becomes voluntary although it is according to the mortal nature we inherit at birth. But the death of the Theotokos, which is the culmination of the Biblical story of redemption has ushered in the experience that all men have been called to since the creation of Adam and Eve. Had they not sinned, Adam and Eve and all their descendants would have acquired immortality, and so she who is All-Holy, the Panagia, could not be held by the tomb. And we do not say that Christ simply chose to raise her body, but rather that death itself could not hold her. St. John of Damascus asks, “How could death swallow [the Virgin]? These things are alien and forever foreign to her God-bearing soul and body.” Noting its embarrassment at the hands of Christ, St. John also states that death approached the Theotokos with trepidation: “It learned from its mistake.” Her painless death and Assumption into glory are a confirmation of the saving work of Jesus Christ, and her passage is the first of that of which all of redeemed humanity will partake.The Theotokos is the greatest advocate of men before God. It is to her that we flee after God Himself and her petitions fill our services and prayers. She is truly the mother of the Church and her abundant love overflows on us all. At the wedding at Cana she interceded before her Son, her last act on earth was to pray for peace, and she continues in this role in an inestimably greater capacity now that she is body and soul in Heaven with Christ. This is a continual theme in Patristic Dormition homilies. It is treated by St. John of Thessalonica, who teaches that Christ has mercy on those who praise His mother, Theoteknos of Livias, St. Theodore the Studite, St. John Maximovitch, etc. She is especially praised in this capacity by St. Germanus of Constantinople: “In times of tribulation you are near, and we find safety in seeking your help; and when it is time to rejoice, you are joy’s sponsor. Whenever we find ourselves completely under your maternal care, we cannot help believing that you live among us … every faith-filled heart runs towards you … every right-believing Christian bears you on his lips.” He even conceives of her as the central channel of grace: “[N]o one is saved but through you, Mother of God; no one is free of danger but through you, Mother of God; no one is redeemed but through you, Mother of God …” St. John of Damascus writes that through her entry into Heaven she has won for us all good things, and St. Gregory Palamas writes that she forevermore bestows her blessings upon all of creation, as she promised just before her repose. It seems this service is of late origin and there is some controversy surrounding the extravagance of its poetic glorifications of the Theotokos. Fr. Serge R. Keleher, a Uniate priest, examines the service in Keleher, Fr. Serge R. “The Funeral of the Mother of God.” Looking East 12 (1977): 16-34, formerly available online at http://basilcrow.com/tmp/dormition-burial-rite.html. According to The Praises or the Sacred Order of the Holy Burial of our Most-Holy Sovereign Lady, the Theotokos and Ever-Virgin Mary printed by St. Tikhon’s Monastery in 1983 the Lamentation service is celebrated on August 17/30 at the Gethsemane Skete (as opposed to 14/27), and is celebrated on 15/28 in the Lavra, presumably of the Kiev Caves. The account of these celebrations is found on the website of the Orthodox Church in America at http://ocafs.oca.org/FeastSaintsViewer.asp?SID=4&ID=1&FSID=102302. Daley, Brian J. Introduction. On the Dormition of Mary: Early Patristic Homilies. Crestwood, NY: St. Vladimir’s Seminary, 1998, p. 4. The Church of the Kathisma was built at the traditional spot where Mary sat down to rest on the way to giving birth to the Savior, as told in the Protoevangelium of James. Hieromonk Makarios, ed. The Synaxarion: the Lives of the Saints of the Orthodox Church. Trans. Mother Maria Rule and Mother Joanna Burton Burton. Vol. 6. Ormylia, Chalkidike, Greece: Holy Convent of the Annunciation of Our Lady, 1998, p. 482 n. 1. The footnote states that the feast was initially celebrated in January in Jerusalem. For the work of Fr. Dumitru and reference to Fr. John see the Oct. 13, 2009 entry on the weblog Mystatogy: http://www.johnsanidopoulos.com/2009/10/apostolic-authorship-of-corpus.html. The same blog also provides two scholarly articles on the topic by a Fr. John Parker: http://www.johnsanidopoulos.com/2009/10/genuiness-of-writings-of-dionysius.html. Daley, On the Dormition of Mary, introduction pp. 12, 13. St. Dimitri of Rosotv. The Assumption of Our Most Holy Lady, the Mother of God and Ever-virgin Mary. Jordanville, NY: Holy Trinity Monastery, 1990, p. 6; St. John Maximovitch, The Orthodox Veneration of Mary, the Birthgiver of God, p. 23; St. Nikolai Velimirovich. The Prologue from Ochrid: Lives of the Saints and Homilies for Every Day of the Year, Part 3: July, August, September. Trans. Mother Maria. Birmingham: Lazarica, 1986, p. 198; Holy Apostles Convent, The Life of the Virgin Mary, the Theotokos, p. 448; Bp. Nathanael of Vienna and Austria. “The Holy Righteous Abraham, Moses and Elias as Preparers of Man’s Salvation.” Orthodox Life 28.6 (Nov- Dec. 1978), p. 45; and the Lamentation service states: “At your Ascension into Heaven all the aerial spirits were overcome with awe and fear, O pure one, and trembled before your power, 2nd Stasis, number 28, p. 18. All these sources thus far are of Slavic origin, but this tradition is also mentioned by Archimandrite Vassilios Bakoyannis, who even says that the Theotokos prayed for two weeks before her repose to be protected from the toll houses, The Mother of Christ: the Mother of God, p. 95. The Mother of God would have asked for protection from the toll houses because she is supremely holy, and thus supremely humble, not trusting in her own works. This tradition should not be considered to in any way detract from her all-holiness. Furthermore, Bp. Nathanael also says, “It is natural for chastity and modesty to seek to avoid all contact and even proximity with those who bear filth, impudence and shamelessness,” The Holy Righteous Abraham, Moses and Elias, p. 45. Bakoyannis, The Mother of Christ: the Mother of God, p. 108. St. Andrew of Crete, Homily on Dormition 3:6-8, 11-13; cf. St. Theodore the Studite, Encomium on the Dormition of Our Holy Lady, the Mother of God 2 where he argues that her Assumption is the final undoing of the transgression of Eve.